THE FIRST. THE ORIGINAL. THE BEST. EVERYTHING ELSE IS JUST IMITATION! Tibetan Treefrog book #15 is now complete!!! Be the first to order the new scripts. Available! 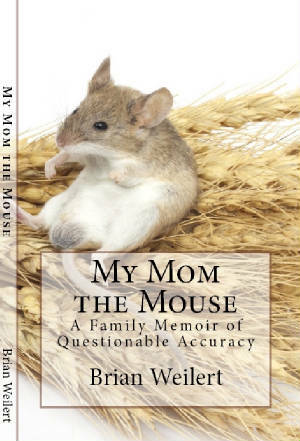 If you love the TTF material, you will be sure to love Brian Weilert's book, My Mom the Mouse (A Family Memoir of Questionable Accuracy). Now available on Amazon Kindle and paperback. You will be able to purchase the book both here and on Amazon. We have gone electronic. All books and scripts will be sent out via email attachments in PDF format. We hope this change will better meet the needs of our customers. Tibetan Treefrog Publishing was created to specifically produce selections for forensic competition. The editions can contain original Prose, Poetry, Humorous/Dramatic pieces, Duets and even ODecs written by our staff. Each edition contains between five to seven pieces. Our staff is comprised of people who have taught and competed at both the high school and college national level. We know what wins! We also understand the importance of finding new material. By purchasing a single issue you will have that edge. Be the one who brings winning pieces to your team. They will thank you for years to come. You can now pay online with PayPal or Credit Card. You can still order by mail using Purchase Order or Check. Due to the variety of rules from state to state; we allow performers to moderately alter scripts to meet their needs. We are not hung up on things such as changing the sexes of characters or adding or subtracting a few words as these open up more interpretations of our writing...which is what we think the activity is about. T.T.F. HAS BEEN ISSUED AN INTERNATIONAL STANDARD SERIAL NUMBERS (ISSN) FROM THE LIBRARY OF CONGRESS. AlSO, EACH BOOK HAS ITS OWN ISBN NUMBER AS WELL. ALL ISSUES NOW MEET STATE, NCFL AND NFL GUIDELINES FOR PUBLICATION.